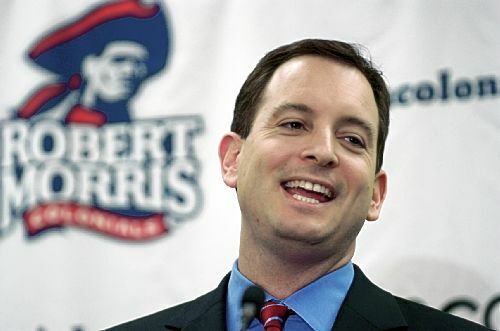 After an offseason filled with flirtations, Robert Morris basketball coach Mike Rice finally appears to have found a new home, landing the job of head coach at Rutgers University. The 41-year-old Rice, who signed a meaningless contract extension with RMU on April 9, was 73-31 in three seasons at Robert Morris, taking the Colonials to two NCAA tournaments and nearly upsetting Villanova in the 2010 NCAA tournament. It was during that recent announcement that RMU athletic director Craig Coleman and university president Greg Dell'Omo announced their intention to invest in whatever it takes to make Robert Morris the new Gonzaga, Butler or Cornell, and it looks like they'll certainly have their work cut out now that they have to conduct a coach-search at this point in the basketball calendar. Rice comes from a basketball family, the son of a former college coach and a college hoops-playing mother. He has worked as an assistant since 1991 in college basketball, including stops at Fordham, Marquette, Niagara, Chicago State, St. Joe's, and Pitt, and seemed to be determined to strike while his personal iron was hot to land a head coaching gig this offseason. He had previously been mentioned in discussions for jobs at Seton Hall, Tulane, Hofstra, and Oregon, among others, and today's news seemed to the outside observer like a foregone conclusion. Rice was a rising stock, and the odds were that he would not be staying at RMU much longer. I just hope for his sake that he made the right decision, as Rutgers was 5-13/15-17 in the Big East last season and possesses a less-than-stellar track record of distinguished basketball alumni from an historical perspective. Good luck to Rice trying to improve that list against the Dixons, Calhouns, and Boeheims of the world; he undoubtedly has a tall task ahead. Rutgers will more than likely be in the Big Tenleven, so he'll be going against Tom Izzo, Thad Matta, and Bo Ryan. A coach doesn't just leave a program he built from scratch to go to a perennial doormat. way to not go get this guy, Penn State.